The New Economics Foundation has joined forces with The Green Party to produce a quite extraordinary document called The New Home Front which advocates wartime austerity, rationing and other such restrictions on liberty as a response to climate change. This has been a long time coming (I wrote about the NEF making similar noises in The Spirit Level Delusion), but this is the most explicit statement yet in favour of viewing austerity, poverty and enforced scarcity as desirable ends. 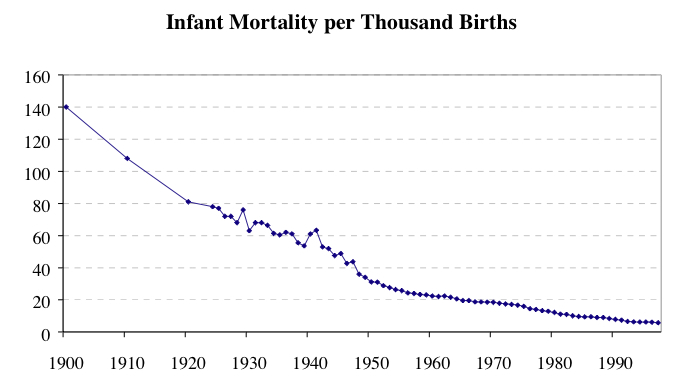 Between 1937–1944: infant mortality (up to age 1) fell from 58 per 1000, to 45 per 1000. Er, maybe, but the war didn't take place between 1937 and 1944, and the infant mortality rate was falling before the war and fell more sharply after it. 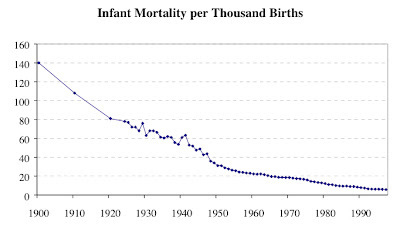 Oh, and the infant mortality rate rose sharply in the darkest years of the war (which began in 1939 and ended in 1945, by the way). Tim Worstall has fisked a good portion of this document already. I will only add that the NEF's view of WWII rationing reflects a warped view of history and is intellectually incoherent. They portray rationing as a "progressive" measure which helped reduce consumption, as if contemporaries viewed consumption as a bad thing. The truth is, of course, that consumption was inevitably going to decline due to the Battle of the Atlantic and rationing was a way of preventing people dying from starvation. It was always considered a necessary evil and the intention was always to get rid of it after the war (it was phased out between 1946 and 1954). Rationing was only (barely) tolerated because of the exceptional circumstances and because the prospect of losing the war inspired people to make extraordinary sacrifices. But when bread rationing was introduced by the Labour Government in July 1946 Churchill called it “one of the gravest announcements that I have ever heard made in the House [of Commons] in the time of peace”. The Daily Mail said it was “the most hated measure ever to have been presented to the people of this country." Although manifestly employed during WWII as a response to scarcity, the NEF want to use rationing as a response to prosperity. And because the aim is to reduce consumption to prevent climate change, logic dictates that such rationing must continue forever. I don't think you have to be a loony libertarian to find this a tad sinister. Over the next six months we are going to search for, and invite, the best ideas to live better, healthier and less wasteful lives from the generation who remember a time when their nation called upon them to do the same. We were always hungry, though we were fed as well as rationing allowed. If going for a weekend away we were issued with a little parcel with a rasher of bacon, a small knob of butter and a container of jam or marmalade. Strict food rationing meant a plain if wholesome diet for growing lads with healthy appetites! We were always hungry! As a result, everyone kept a keen lookout for any extras going — offal and brawn at the butchers were not `on ration` and vegetables and fruit in season were always in demand. I hated everything being on ration. In the morning we used to get up and my Mum always used to be making porridge. But because sugar was on ration it tasted horrible, and it tasted worse if you put salt on it. "The rich people will not suffer. The middle class, the poor people, the people with children, they're the ones who are going to suffer. Bread for breakfast, bread for dinner, bread for tea for them. And therefore we, the British Housewives' League will not stand for bread rationing." Even many years after the end of the war, when nostalgia for their youth began to cloud their memories, the misery of rationing was always vividly recalled by those who endured it. Like Scarlett O'Hara, veterans of the war resolved never be hungry again and set about creating the land of prosperity and plenty that the NEF now find so intolerable. 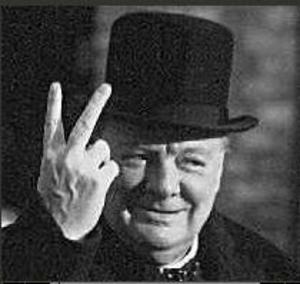 So let's hope the NEF ask WWII survivors what they think about creating a 'New Home Front' and let's hope the pensioners give them a suitably Churchillian reply. "and stopping the 50,000 deaths a year that occur as a result of [road traffic] air pollution - a toll which makes air pollution as harmful[sic] as passive smoking." That, and the fact that most of them were bloody comandeerd for the army! The Green agenda has always been to get back to the Stone Age. Hunter-gatherers with wooden bicycles and wind-up radios. Not just for them, of course. We all have to join in. So this NEF bunch of tossers doesn't believe in five portions (of fruit and veggies) a day then? Coz on rationing you can't do it unless you grow your own.I have a garden, many in cities do not have nor an allotment either. These people are idiots. the only way to affect climate change is to ask the sun to just stop doing what its been doing for several billion years. If Both Bush Presidents were considered dangeropus because of their vision that it was their job to bring about the end of civilisation through "armgeddon", then the "Greens" must be considered EQUALLY as dangerous.